(L-R): Bob Leonard, Ridgebury Township; Brian McGuire, Five Star Equipment; Ray Bellows, Ridgebury Township; and Scott Phillips, Ridgebury Township. "Having all of the controls right in front of you is a nice change rather than twisting for controls behind you. The EH controls will allow us to create settings for each operator. The bucket shake feature will also come in handy," said Bob Leonard, Ridgebury Township road foreman. "The loan of a 524K until the 524L was ready made a huge difference. Five Star promised to keep us in business while we waited," said Scott Phillips, Ridgebury Township supervisor. 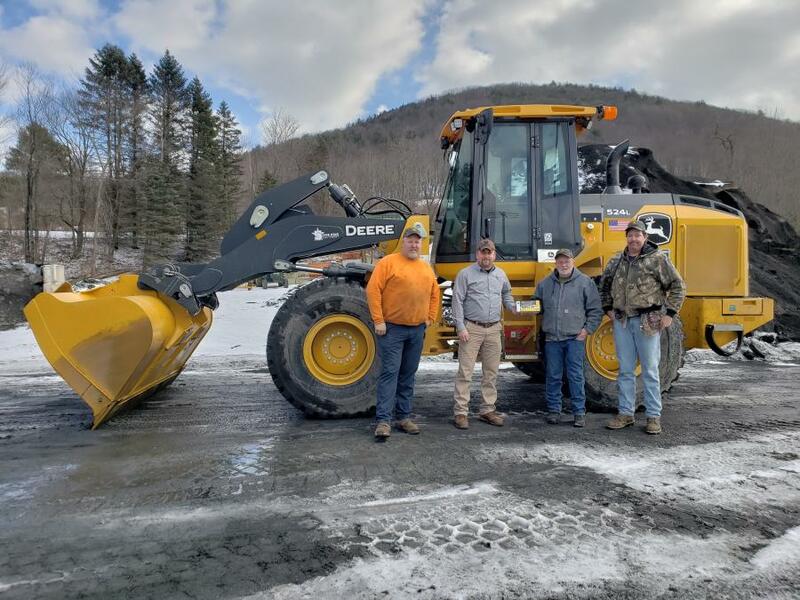 "It'll be nice that we can now use all John Deere service items like filters and fluids, since we already use them for the grader and backhoe, everything will be the same," said Phillips. For more information, call 800/441-8195 or visit www.fivestarequipment.com.